The Precision plastic garden dump cart features a rust resistant, heavy duty poly hopper that is easy to clean and easy to use. 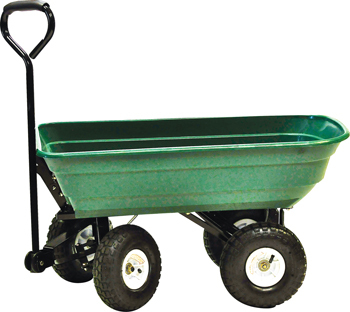 The cart is designed to easily transport and dump heavy loads, strengthened by two steel reinforcement braces , includes pneumatic tires, an easy to use spring loaded dump mechanism and has a 600 lb. load capacity.